Have you heard of NaNoWriMo ? I just learned about this great initiative, even though it has been working for years. It is never late, they say. 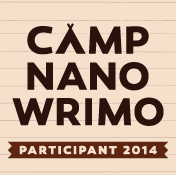 Specially because I just learned about it on time to join the summer session or NaNoWriMo Camp! I think it is a great way to start writing (or keep doing it) with the added value of having a goal and other participants to share your progress with. In the Camp session, there are groups or CABINS with participants divided by similarities. If you are an author and write in Spanish, I invite you to find me and join my cabin (my user name will be inesgaliano ). Later, if you reach your goal, you will be considered a NaNoWriMo winner and you will have some winner goodies from stores like Amazon, Lulu, Scrivener and many more. Also, you can choose your goal, your genre and even the language you want to write in. Since it is just a program to encourage you to write, they don’t keep your manuscript and you are completely free about what you want to do with it. Unlike in other programs, your manuscript is just yours. You can decide to publish it later (or not). Learn more about it at their website or at the Camp website!